Kobe steak is literally and figuratively a different bread of steak. The steaks come from the Kobe bread of cattle, and Kobe itself is trademarked to beef coming from Japan. Here in the states it’s call Wigyu or frequently “Kobe Style” beef. What makes this beef unique, in the tremendous amount of marbling (fat) that runs through the steaks. That fat, bring with it a tremendous amount of favor, and a very unique texture. Unfortunately, it’s expensive (can be over $40/lbs) and so I only have it on very special occasions. But everytime I do cook one, I absolutely love it. In this video, I show you how to pan roast a Kobe New York Strip, and serve it along with some simple sautéed mushrooms. It’s a very nice combo, and one that I’m sure you’ll love! Hope you enjoy this steak, as much I do. Kobe steak is super rich because of the high fat content. And while I love all steak, I actually like smaller portions of Kobe, as too much just wears out the pallet. That’s nice, because it’s already so expensive. Normally I like my New York Strips medium rare. And I’m splitting hairs here, because while I don’t suggest going to medium, I do think Kobe can use a bit more cooking than USDA prime. The additional fat needs a bit more time to melt and soften, so I like to cook mine for about 1 minute longer than normal. Also to help make sure the fat melts, make sure to let the steak come up to room temperature before searing it off. Tilt the pan so the melted butter collects to one side, and use a spoon to drizzle it over the top of the steak. Repeat 5 – 8 times, and then remove the steak to a holding pan to rest. After 3 – 5 minutes (again depending on thickness of the steak) the meat is ready to served. Either cut in half and serve two portions, or cut half inch slices, and serve fanned out on a warm plate. For this “king of steaks”, I think you need to go with the king of red wines Cabernet Sauvignon. 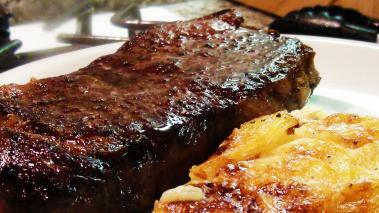 The heavy, full bodied flavors will stand well to the red meat, and rosemary sauce. And the flavorful fat in the steak will help lubricate the dry mouth feel the tannin in the red wine produces. It’s a food and wine pairing made in heaven.